Anyway… that’s enough nostalgia for now! 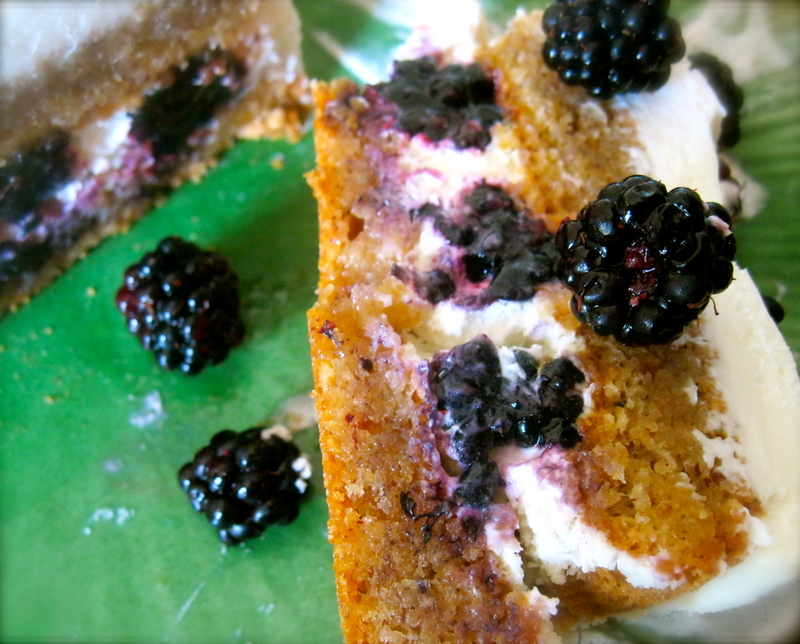 Wanna know how I made this gluten-free, reduced sugar, little gem? Even though I used blackberries and hazelnuts, you could make this with lots of other combinations if these aren’t readily available to you. Cherry-Almond? Peach-Almond? Strawberry-Pistachio? The possiblities are endless. 1.) Toast hazelnuts in 350F oven for about 15 minutes, shaking pan every few minutes to ensure even cooking. This will make your house smell amazing by the way! Remove from the oven when fragrant and golden brown, transfer to a dish towel and rub vigorously to remove the skins. Don’t fuss if there are a few remaining, but do try to get most off. Let cool, then grind to a powder in a food processor or coffee grinder. 2.) Turn oven down to 300F and line to pans of equal size with parchment paper (I did two loaf pans, because that it the only size pan I have two of, but the original recipe used two 9 inch pie tins). Make your meringue by beating the egg whites and salt until stiff peaks form (you will probably need an electric beater unless you have crazy strong and fast arms). Beat in two tablespoons of the sugar and then fold the rest of the sugar in, two tablespoons at a time. Fold in the ground hazelnuts. 3.) Divide mixture evenly between prepared pans and bake for about 1 hour and 15 minutes, covering with foil if it browns too quickly. Let cool completely on wire racks before assembling cake. 4.) Meanwhile you can prepare the whipped filling by beating the whipping cream (again, bust out that electric mixer for this job) until thick and fluffy. Mix in the greek yogurt by hand and add a touch of sweetener if desired (I used stevia). If you don’t have greek yogurt, do NOT use regular yogurt- it will be too runny. 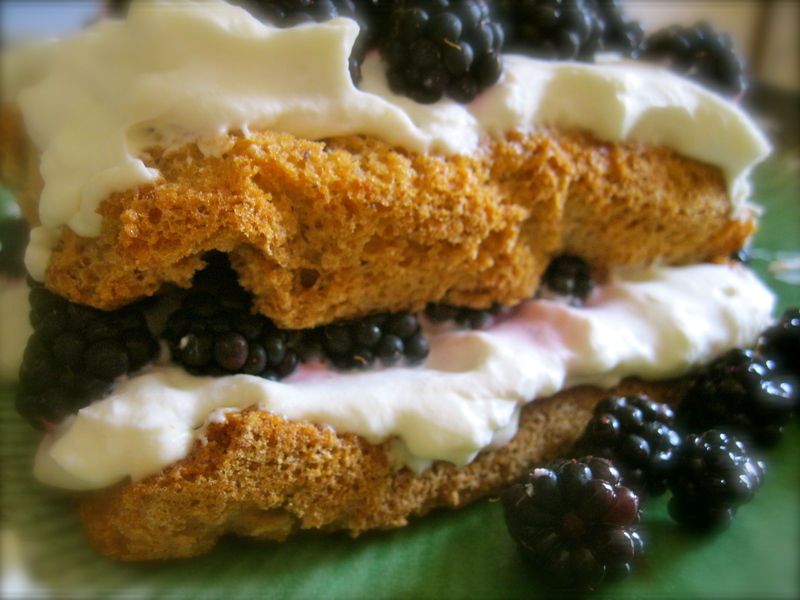 You can use all whipping cream (1 1/4 cups) also, I used greek yogurt for the health benefits and slight tang it imparts. 5.) 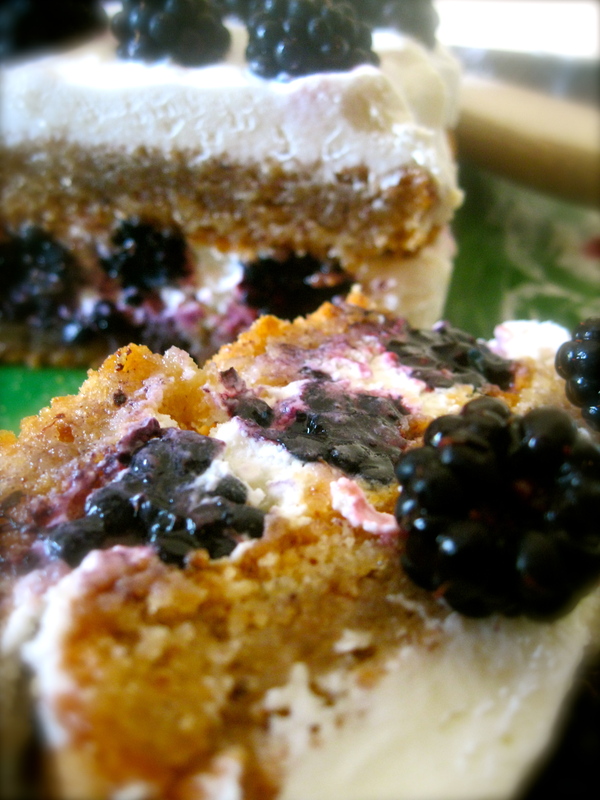 When cake is cool, lay one slice on a large plate and generously frost, then dot with berries. Lay the other half on top and frost and top with more berries. Isn’t it pretty? You can eat it now and it will be delicious, but it will be prettier, tastier, and much easier to cut if you let it sit a few hours or overnight in the fridge. Well I’m off to Mt. Hood with a couple of my clients for work now. It’s just a short trip (1 day and one night) and lets hope everything goes smoothly! Despite working the same hours and biking the same route as last weekend, my day felt brighter today. Maybe it’s just the sunshine or the heat (we finally hit 90 today! ), but I just really was feeling appreciative of and connected to nature. Riding my bike or walking to work gives me a chance to pay attention to things that I miss when I’m driving. The sights, the sounds, the smells. Sometimes they are really pleasant, sometimes they’re pretty gross. Today smelled like backyard grilling and lilies. And sweat, but that was just me. Like I said, it was hot! Last week smelled like death because of a dead raccoon I passed. Gross? Yes. But… as a CNA and nursing student, I understand life is often gross. Something I love about Oregon is the overall feeling of wilderness. Trees are everywhere. They reach out to each other across the roads, forming canopies. Their branches like biceps that would crush me in an embrace. Moss is everywhere, climbing the trees and draping them like feathered boas. The moss also threatens to reclaim areas that humans have paved with concrete. People fight it but I like the way it looks: a reminder than mother nature is bigger than we are. 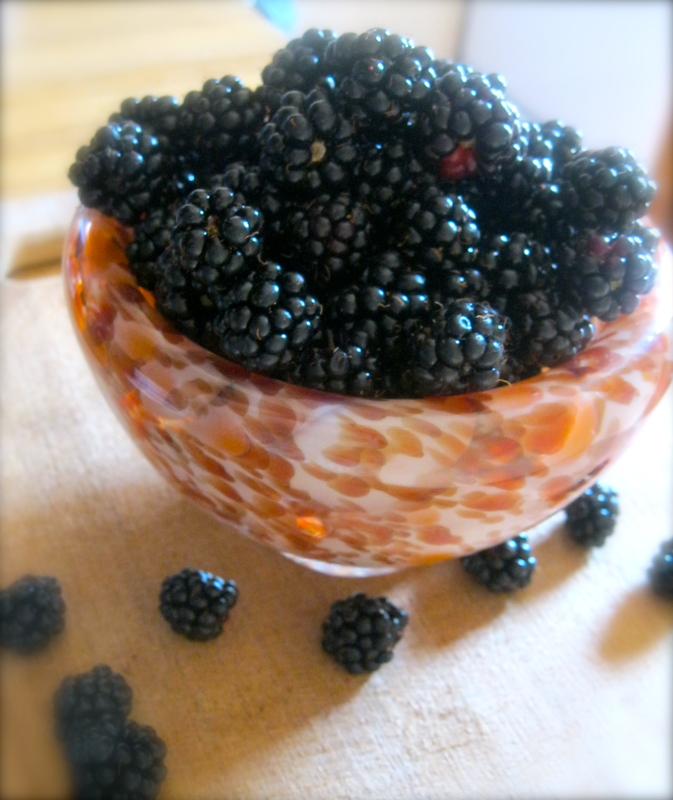 As a child growing up in the midwest, we would pick blackberries at a local park every summer. My mom would turn them into amazing pies if she could pry us away from eating them out of hand. Before I left for Portland, I asked my then fiance if he would go to the park to pick berries with me to make a pie so I could relish my sweet memories one last time. He agreed to, like a good sport and off we went- only to be eaten alive by mosquitos and have nothing but a bowl of tiny, dry berries to prove for it… Little did I know what Oregon had in store for me! When we arrived here, the first thing I was struck by was the berries! They were everywhere- thorny brambles literally cascading down the walls by the highway, dripping with the biggest, juiciest berries I’d ever seen. And not a mosquito in sight! I’ve since learned this particular variety of berry is an invasive species, but that doesn’t stop them from being delicious. Oregon has other native species, but the Himalayan Blackberry happens to be the easiest to find. I picked the above berries by the side of the road about a block from my apartment. I’m currently brainstorming and planning a post to commemorate my 2 year Oregon-iversary which will be next week. It’s going to include another Oregon favorite as well- hazelnuts! Also, if anyone cares to check it out, I opened an Etsy account yesterday. 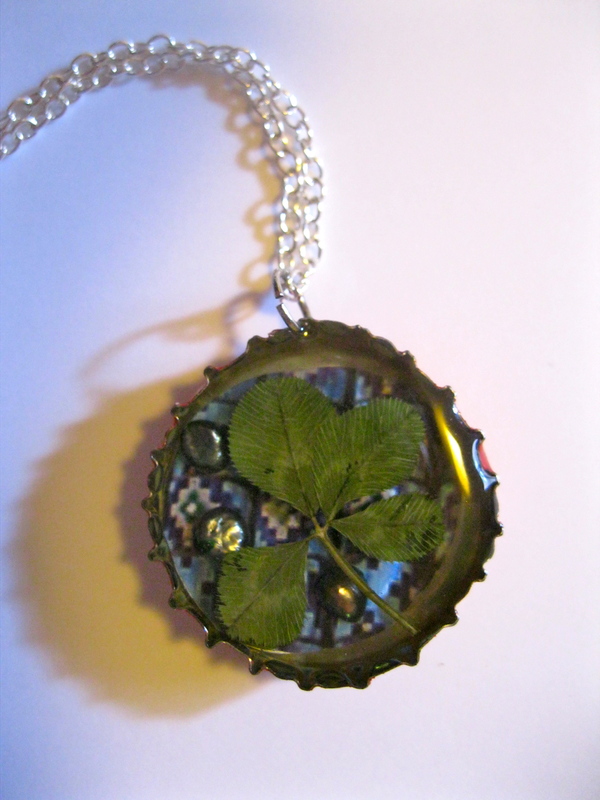 I am making jewelry out of four leaf clovers and other natural items I find. See more here.